For as long as I can remember I have wanted to see the cherry blossom festival in Washington, D.C. I am thrilled that this year, I did. It was even more beautiful than I expected. I felt as though I were walking through clouds of pink, yellow, and white blossoms. This weekend was the first warm and sunny one in DC and it was clearly the height of the festival. In addition to the cherry blossoms, we enjoyed brightly blooming forsythia as well as fluffy almond and elegant magnolia trees. 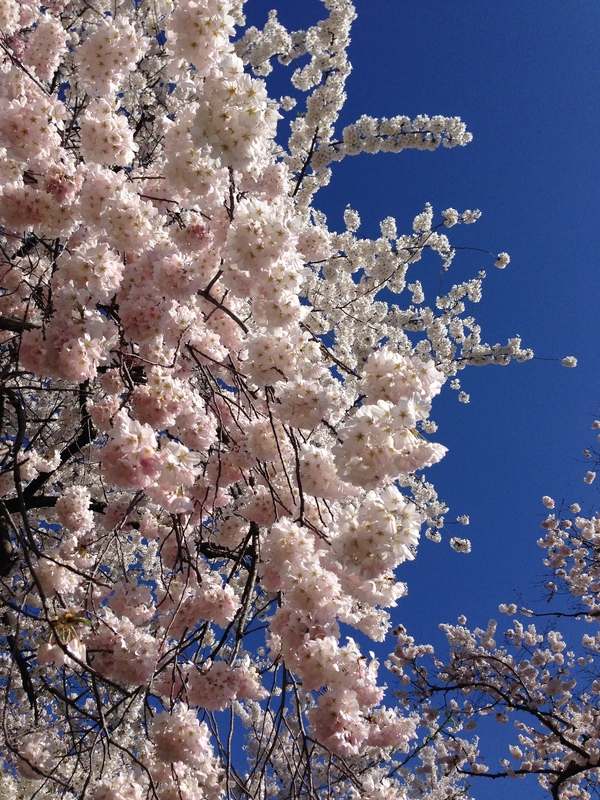 In case you didn’t know, the National Cherry Blossom Festival each year celebrates the gift of 3,000 cherry blossom trees to the United States from Japan in 1912. The gift commemorates the friendship between the two nations. In addition to enjoying the splendor of Japan’s generosity, we had some fantastic meals at Zaytinya, Hill Country Barbecue, and Cava — each better than the last. Thanks to my wonderful friend Desi for hosting this great adventure!